USConcertina.com has assembled the following historical timeline of concertina-related events to provide you with a perspective on the long history of the concertina, and specifically the chemnitzer concertina in the United States. In ancient China, under the rule of Emperor Huang Tei, a mouth blown musical instrument is created. It uses free reeds placed in resonator pipes and is named a ‘tscheng’. The Abbey Vogler brings a tscheng back to Europe after seeing one while on a visit to Russia. Grenie of Bordeaux, France invents an organ which uses free reeds in resonator pipes as well as the traditional flue pipes. Eschenbach of Bavaria produces the ‘Organo Violine’ which uses free reeds. Slimbach produces the ‘Aeroline’, ‘Eoline’ or ‘Elodion’, and adapts two air pumps to his instrument in 1820. Haeckel of Vienna produces the ‘Physharmonica’ to be fitted under a piano keyboard. Friedrich Buschman of Berlin produces the ‘Aerolina’, a free-reed instrument blown by the mouth. This was a predecessor to the modern harmonica. 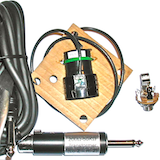 Buschman produces a bellows-driven version of his ‘Aerolina’, calling it the ‘Handaeoline’. Hotz begins making harmonicas in Khittlingen. The factory eventually becomes part of the Hohner Corporation. Messner begins making harmonicas in Trossingen, Wurtemburg, where a Hohner factory is eventually situated. Jacob Alexandre founds his firm of reed organ Harmonium builders in Paris, France.J.W.Glier founds the Klingenthal Harmonica Industry. Cyrillus Demian in Vienna improves upon Buschmann’s ‘Handaeoline’ and produces an instrument he calls the ‘Handharmonica’. Charles Wheatstone receives a patent entitled ‘Improvements to musical instruments’. The main subject is a keying system and keyboard layout, and the application is to a mouth blown ‘Symphonium’. He is reputed to have made various experimental instruments. Carl Zimmerman of Carlsfeld, Saxony introduces a concertina with ten buttons on each side. The bisoronic instrument produces forty notes. Carl F. Uhlig of Chemnitz, Germany was an accomplished button accordion musician. Dissatisfied with the bass end of the instrument, he ‘chopped the right hand keyboard in half’ and fitted it into a small hexagonal box. With five buttons on each side, he calls the new instrument a ‘Concertina’. This design quickly gains another row of buttons so that it would play in two keys, C and G. These instruments were produced cheaply and in large quantities. Many went to Ireland and England. Little more than a toy, it was probably a simple money maker for the manufacturer. Uhlig continued to develop his own instrument and to improve upon Carl Zimmerman’s earlier design. Debain, a reed organ maker in Paris, produces an expressive reed organ with two different air pressures in an attempt to strengthen the melody over the accompaniment. He also calls his instrument a ‘Concertina’. Henrich Band, a music teacher and bandmaster from Krefeld on Rhine, learns Uhlig’s concertina and tries to play it in his town band. The instrument is now square with 27 or 28 buttons. Band continues to look for ways to improve the instrument for orchestral use. Charles Wheatstone receives a patent for ‘An Improved Concertina’, a detailed design for an instrument similar to those produced today. The patent covered various duet keyboard systems and also included other features like the ability to tune the reeds externally with a watch key and ‘plucking’ the reeds to make them ‘speak’ faster. Wheatstone’s instruments played the same note press or draw. His patent covered a flap valve arrangement that allowed the same reed to be used for either movement of the bellows. It directed the air to pass through the reed in the same direction for press or draw. Henrich Band produces and markets an improved version of Uhlig’s concertina. The new design has 50 buttons and he called it a ‘Band-Union’ concertina because his family and relatives were all involved in creating it. The number of buttons gradually increases over the next thirty years to 53, 56, 64 and finally 65 (the 130-key bandoneon). Uhlig’s 56-key concertina is being produced by Carl Zimmerman in Carlsfeldt, Germany for export to the United States. J.M.Stroh, known for the “Stroh Violin” that featured a horn and sound box for better acoustics, works with Charles Wheatstone to patent a design for a harmonium. Though Wheatstone patented a concertina, it is Stroh who is thought to have perfected its sound by determining the correct size for the tone chambers. Bouton of Paris, France invents the piano accordion. Uhlig chairs a committee of eleven other concertina manufacturers in Chemnitz, Germany to develop the standardized ‘Chemnitzer’ keyboard and music notation. It is thought to be based on a system originally conceived by Henrich Band in 1846. At this point a split begins between the bandoneon and the chemnitzer. The bandoneon captures the German market, and the chemnitzer becomes mainly an export to the United States. William Wheatstone, Charles Wheatstone’s brother, patents a new action to move the buttons nearer the top of the instrument. Death of Louis Lachenal, subcontractor to Wheatstone. Lachenal & Company continues making concertinas for Wheatstone up to about 1865. Uhlig turns over the manufacture of his concertina to longtime employee, Friedrich Anton Lange. Ernest Ludwig Arnold takes over Carl Zimmerman’s business in Carlsfeldt, Germany. This later becomes the firm of manufacturer Alfred Arnold. Friedrich Lange moves his concertina factory to Chemnitz-Bernsdorf, Germany. The number of reeds in a chemnitzer concertina are doubled, sounding an octave for each tone. Carl F. Uhlig passes away. The keyboard of the Uhlig-designed chemnitzer is expanded to 38 buttons (76-key). Otto Georgi emigrates from Chemnitz, Germany to Chicago, Illinois where he plays, teaches, promotes, imports and publishes music for the chemnitzer concertina. Professor MacCann patents a system for a duet type concertina, similar to William Wheatstone’s ideas in 1861. Henry Silberhorn emigrates from Bavaria to Chicago, Illinois where he plays, teaches, promotes, imports and publishes music for the chemnitzer concertina. Lachenal & Company registers a design for their ‘Edeophone’. Otto Georgi organizes the Chicago Concertina Club in Chicago, Illinois. Henry Silberhorn begins instructing students to play the chemnitzer concertina in Chicago, Illinois. The Milwaukee Concertina Circle is organized in Milwaukee, Wisconsin. Ernest Glass begins to produce chemnitzer concertinas in Chicago, Illinois under the brand name of Glass. Friedrich Anton Lange passes the Lange Concertina Company to his son, Friedrich Emil Lange. Friedrich Anton Lange passes away. The Czech-American Concertina Club is organized in Chicago, Illinois. Otto Georgi and Friedrich Emil Lange display chemnitzer concertinas at the Columbian Exposition in Chicago, Illinois. John Butterworth patents another duet system named ‘The Crane’. A large firm named Crane takes up the manufacture of these concertinas in Liverpool, England. Lachenal & Company, who assisted Butterworth with his patent, builds the instruments for Crane. Wheatstone & Company produces their first eight-sided ‘Aeola’ design. The 102-key chemnitzer is exported to the United States, though photos of Uhlig would suggest that he was very close to finalizing the design back in 1874. The 142-key diatonic bandoneon is available in Argentina. German sailors are reputed to be selling them in the streets of Buenos Aires. The popular tango emerges with the bandoneon as the principal instrument. Otto Georgi and Louis Vitak partner (Georgi & Vitak) to sell concertinas and sheet music arranged for the chemnitzer from their store in Chicago, Illinois. Otto Schlicht and his associates begin to produce chemnitzer concertinas in the United States for Georgi & Vitak under the Pearl Queen brand name. The Salvation Army starts using Crane duet concertinas, renaming them the ‘Triumph’ system. Henry Silberhorn publishes his first version of ‘Henry Silberhorn’s Instructor for the Concertina’. Ernest Glass is joined by his sons Otto and Paul in the manufacture of Glass Concertinas. Andrew Karpek begins to manufacture and sell accordions and concertinas from his store in Milwaukee, Wisconsin. Rudy Patek begins to sell concertinas and sheet music arranged for the chemnitzer from his store in Chicago, Illinois. Otto Schlicht and his associates begin to produce chemnitzer concertinas in the United States for Rudy Patek under the Patek brand name. The International Accordion Company opens in Chicago, Illinois, founded by Walter Kadlubowski Sr., Walter Mojsewicz and Kajetan Perkowski. They manufacture several models of accordions and chemnitzer concertinas under the brand names of International, Schukert, Sitak, and Silberhorn. The Cicero Concertina Circle is founded in Cicero, Illinois. Otto Georgi and Louis Vitak partner (Georgi & Vitak) end their partnership. Louis Vitak and his nephew, Joseph P. Elsnic, partner (Vitak & Elsnic) to sell concertinas and sheet music arranged for the chemnitzer from their store in Chicago, Illinois. The International Accordion Company begins producing chemnitzer concertinas under the brand name of Star. Henry Silberhorn begins selling the Clarion Concertina, an instrument built according to his own design. Henry Silberhorn organizes the Clarion Concertina Club in Chicago, Illinois. The International Accordion Company goes out of business while Walter Mojsiewicz continues to build their Star brand concertinas under a new company, the Star Concertina and Music Company. Otto Schlicht receives a patent for ‘Action for a Concertina’, improving upon previous designs from other manufacturers. Friedrich Emil Lange passes away. Lachenal & Company closes for business. Walter Kadlubowski Sr. passes away. The chemnitzer makes its way into mainstream polka music in the United States. Musicians and arrangers such as Eddie Zima introduce the instrument and extend its popularity to thousands of Polish-American music fans. Pat Watters begins to sell concertinas and sheet music arranged for the chemnitzer from his store in Minneapolis, Minnesota. Otto Schlicht and his associates close their Chicago factory. Otto and Paul Glass cease the production of the Glass Concertina. Christy Hengel begins to produce concertinas in Sleepy Eye, Minnesota under the brand name of Hengel using concertina manufacturing equipment purchased from Otto Schlicht. Christy moves the manufacturing to Waseca, Minnesota in 1958 and finally to New Ulm, Minnesota in 1965. Stan Uhlir begins to produce concertinas in Minneapolis, Minnesota under the brand name of Echo. Walter Kadlubowski Jr. purchases Star Concertina in Chicago, Illinois. Eraldo Carbonari joins Walter Kadlubowski Jr. as a partner in Star Concertina in Chicago, Illinois. Anton Wolfe purchases Rudy Patek’s remaining stock of concertina components and begins to manufacture the Wolfe brand concertina in Stevens Point, Wisconsin. The Central Wisconsin Concertina Club is founded in Wausau, Wisconsin. Pompilio Rosciani and Umberto Carroci, owners of the Imperial Accordion Company, purchase Star Concertina in Chicago, Illinois. The World Concertina Congress (“WCC”) is established. Steve Dickinson purchases Wheatstone & Company. Art Altenburg opens Art’s Concertina Bar in Milwaukee, Wisconsin featuring weekly chemnitzer concertina jam sessions. Wheatstone & Company changes their name to Boosey & Hawkes (Concertinas) Limited. Bob Novak joins Stan Uhlir to assist with the design and manufacture of the Echo Concertina. Bill Brown of Brown’s Music Store in New Ulm, Minnesota acquires the remaining sheet music inventory of the Vitak-Elsnic company. Walter Kadlubowski Jr. and Rich Raclawski began building Eagle brand concertinas in Prospect Heights, Illinois. John Bernhardt and Ed Cogana purchase Star Concertina in Chicago, Illinois. Bernhardt eventually becomes sole owner. Bob Novak becomes sole owner of Echo Concertina. Boosey & Hawkes (Concertinas) Limited closes for business. Karpek Concertina closes its Milwaukee, Wisconsin store. Walter Kadlubowski Jr. passes away. Rich Raclawski becomes sole owner of Eagle Concertina. 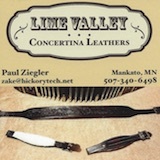 Anton Wolfe sells the majority of his concertina tooling and parts inventory to Jerry Minar of New Prague, Minnesota. Jerry Minar begins his Hengel Concertina building career, selling Hengel brand concertinas as part of his company, JBM Sound, Inc.
ConcertinaMusic.com is introduced to the world via the Internet with a very modest collection of one, free sheet music title: ‘All I Want For Christmas Is A Concertina’. Stanley Uhlir, original manufacturer of the Echo brand concertina passes away. Star Concertina of Chicago, Illinois, closes for business. The Czech Area Concertina Club is founded in New Prague, Minnesota. John Bernhardt, the last owner of Star Concertina passes away. Art Altenburg sells Art’s Concertina Bar in Milwaukee, Wisconsin to Andy Kochanski. The renamed Kochanski’s Concertina Beer Hall maintains Altenburg’s concertina traditions. Josh Sellner begins to manufacture the Supreme Concertina in Sleepy Eye, Minnesota. The United States Concertina Association (“USCA” or “USConcertina.com“) is founded as a virtual entity.